Pendleton while I slept, then he slept while I drove over the Blue Mountains in a snowstorm. The car handled very well in the snow, as expected. Listening to The Known World, an audiobook I picked up at the library, I was able to drive as far as Baker City. Around 2AM I found the Oregon Trail agate site, along the dirt road which branches right off the gravel road which leaves OR Hwy 86 across from the OT interpretive center, but an inch of new snow obscured the agates when I went looking for a few minutes at dawn. I slept in the back of the car, David in the passenger seat. It was a little cramped but not too uncomfortable. We stopped at Lime to look for the crystal site I read about some years ago but couldn't find anything but limestone. The cement plant is closed and is deteriorating quite photogenically. I took a few pictures; David wanted to but couldn't rouse himself from sleep. A stiff westerly breeze was blowing so I couldn't stay out long. After Boise the wind turned fierce, scouring the landscape for tumbleweeds and sending them stampeding across fields, vaulting fences and bounding through freeway traffic. Some were barely larger than squirrels, others the size and color of bears, all racing before the wind or gathering in restless piles in gullies and hollows. At Mountain Home we turned south off the freeway to check out the big sand dune at Bruneau Dunes State Park. Dropping through the rim rock on our descent to the Snake River we ran into a big drift of tumbleweeds stretching nearly across the road and deep enough to bury a pickup truck. I was pleasantly surprised to find that Bruneau Dunes is a natural area where ORV's are prohibited. The wind was raking sand off the top of the dunes in a gritty brown curtain, very impressive and certain death to exposed cameras. We took a few furtive photos and hiked to the crest of the big one where wind-blown sand blasted our pants cuffs. I didn't take time to identify the windswept ducks on the lake but did notice a Northern Harrier working the brushy drainage west of the dune. It's a place I'd like to visit again in more favorable conditions, particularly during spring migration. On our way east to Twin Falls we reached Susan on the phone. I described the wind, the big dune, the dusty yellow clouds and the herds of tumbleweed and she enjoyed picturing the scene. Heading south on US 93 into Nevada we found ourselves pursuing a snowstorm which like a mirage kept fading away ahead of us leaving bright snowy hills under a windy blue sky with cold sunlight streaming in from the west. We eventually caught up to a little snow around dusk just north of Ely but the main event had passed through earlier in the day leaving several inches in town with drifts up to a foot deep around the parking lot of the Rustic Inn, a humble but comfortable (poor but honest...) little place I found in the yellow pages. The proprietor recommended La Fiesta for Mexican food so we went there and spent $25 on too much dinner after checking in to our $50 motel. We encountered only 3 vehicles in the 60-odd miles between Ely (pronounced Eely) and Baker, at the entrance to Great Basin National Park. Convinced that we were on Mountain Time (having come south and east from Idaho, which is on Mountain Time) we left at 6AM thinking it was 7 and we had an hour and a half to make it to GBNP for our cave tour. That would have been plenty of time had we not used up the half hour and then some on photo stops for elk and snow and vast valleys with long shadows cast by early morning sunshine. Finding ourselves with 40 miles to go in 41 minutes we made it in 35, not bad considering that we encountered several extended sections of black ice which limited us to 50mph or so. Turns out the Subaru is quite comfortable with 80mph and handles 100mph acceptably if given a long enough section of straight, smooth and slightly downhill roadway. At the Lehman Cave Visitor's Center the ranger was just putting up the flag when we arrived. I was not inclined to believe him at first when he told me they were on Pacific Time and we were an hour early for our cave tour, but that did explain why the clock at the motel in Ely had been an hour slow. We used our extra hour to eat a leisurely breakfast in the sunshine in front of the visitor's center where the snowbanks were just receding from the front lawn and the only clouds in the deep blue sky were hovering over snowy mountains on the horizon 100 miles to the east. 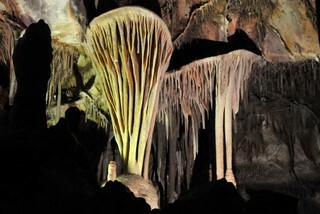 The cave tour was a bit awkward at first. David and I were the only tourists but our guide addressed us as if we were a crowd of 20 rather than 2, proceeding through his presentation despite our comments intended to indicate that we already knew some of this stuff. And we were only half listening anyhow, crouching on the concrete path to brace our cameras for photos of dimly-lit limestone in fantastic formations - columns dripping with stone icicles, shields festooned with stone pendants, globes of stone hanging from the ceiling like inverted onions, thickets of slender stone tubes and multi-branched stalactites with limbs defying gravity in their contortions. To his credit our guide actually knew quite a bit about cave geology and clearly loved his subject. He discussed the phenomenon of cold-temperature calcite recrystallization inside stalactites, something which has always puzzled me, as well as how shields apparently form by extrusion of pressurized carbonate-rich water and straws and helictites by capillary action, and how new food chains are evolving to exploit the carbon smudges left on the cave ceiling by the carbide lamps of 19th century cave explorers. After a photo stop for a herd of deer as we were leaving the park we headed south on Hwy 21 towards Milford and Beaver, again pursuing a snowstorm which we caught between Beaver and Panguitch. The farther south we drove the snowier the landscape became leading me to wonder what we would encounter around Pariah Canyon. We again stopped for photos all along the way, particularly for birds both north and south of Milford. Birds large and small were attracted to bare ground along the edges of the road. In the last snow-free valley before Milford we had a prairie falcon, a dark-phase Ferruginous Hawk and a Golden Eagle and shortly before Milford we had a pair of Red-tailed Hawks. Just south of town a flock of Western Meadowlarks was foraging on the side of the road and in an adjacent field a colony of ground squirrels had attracted two light-phase Ferruginous Hawks, another Prairie Falcon and another Golden Eagle. Along the way we also tried, unsuccessfully, for photos of Horned Larks and Mountain Bluebirds. I wasn't quite quick enough with the focus. The final photo stop was one I should have made and didn't, for a small group of antelope foraging along and even in the road south of Panguitch. I had to slow way down and honk my horn to persuade the one in the road to move aside - would have been great close-up shots. 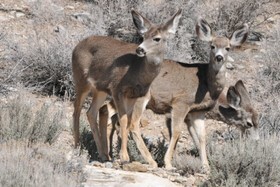 I figured I'd have another chance but having never seen antelope so close before, I should have known better. South of Panguitch we finally began to leave the storm behind us but the snowpack continued to increase until we reached the pass north of the turnoff to Zion, 3-4 feet up there and crusty snowfields lingering on shady slopes all the way down to where we stopped for the night, about 7 miles north of Kanab. There we found the ORV track off the east end of the old road and followed it about a third of a mile in before the sand became too soft. We found a campsite there and though it was nearly 6PM, set off to the north across bright orange sand dunes stabilized with juniper, rabbitbrush, oaks and scattered Ponderosa pines. 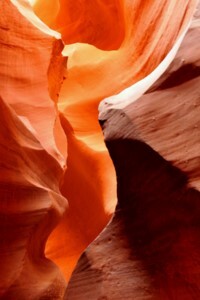 Our objective was Peekaboo canyon, aka Red canyon, a small but colorful slot which runs east-west along the north edge of the dunes. When we hadn't reached the wash in 45 minutes I realized we wouldn't make it so we turned back, reaching the car right at sunset. The evening was cold and breezy so we ate supper in the car, more of the delicious lasagna Susan had sent with us. Thanks to her provisioning and a couple of meals out, we never did have to fire up the stove the whole trip. That was a big help, giving us that much more time to spend out hiking around taking pictures. Frosty morning with dawn around 6:45 Mountain Daylight Time. We packed up quickly and drove to the Pariah ranger station where we ate breakfast while waiting for the doors to open. About 10 groups were applying for Coyote Buttes North permits; we were assigned number six. At 9:05AM a volunteer ranger spun the wire cage and the first ball she pulled out was #6, so once again, we were in. I thanked Jesus because I'd been talking with him during the night about how I'd been mistaken about the timezone, even though I'd been convinced that I was right, and how I might also be mistaken in my conviction that I'm not saved. Evidently I'm not always correct in my beliefs, and Jesus might be able to do something with that. The 18.5 mile drive from hwy 89 to the Paw Hole trailhead for Coyote Buttes South was tough. The first 10 miles to the Arizona state line (2 miles past the Wire Pass trailhead) were deeply rutted and often rocky, though fortunately the dirt was hard-packed and only slippery in a few places. The last 2 1/2 miles of soft orange sand after the turn-off to Paw Hole would probably would have been impassable for us were it not firmed up by underlying moisture from winter snow, patches of which still lingered on shady corners. before reaching more rock, some red ledges and teepees with a yellowish clump of muffin-topped crags not far beyond. Studying the map later I figured out that we were in the Cottonwood Cove area, but all we knew at the time is that we were a long ways from the car so we didn't explore as far as we'd have liked. We headed back about 2 1/2 hours before sunset and reached the car just as the light became too dim for photos. Other than Side-blotched Lizards, we didn't see any wildlife and only a few birds - Ravens, Pinon Jays and a Townsend's Solitaire up among the rocks and a flock of Mountain Bluebirds, a few Juncos and a Loggerhead? Shrike along the road in. I tried for a photo of the bluebirds but they were restless because of the shrike, which took off in pursuit of one of them as we approached. parking lot we were all packed up and sitting in the car with the heater running, eating breakfast. We set out for the Wave at sunrise. Above the two red teepees that the BLM directions reference as landmarks on the way to the Wave, there's a cove enclosed on three sides by weird and wonderful sandstone textures. Daniel and I came across it two years ago on our way back to the car so I took David up there this morning on the way in. It was not far out of our way and well worth the visit. Continuing south along sloping sandstone slabs, across a ledgy wash and up a sandy gully, we reached the Wave about a half hour after the sun did, and the light was still very good. The pool on the floor was larger than two years ago, better for reflections, but on the other hand the sand in the gully to the right was all tracked out. I didn't think to try to brush it out smooth; fortunately the tracks don't distract much from the stunning patterns and colors of the stone. I took 150 photos in about an hour; going through them all and editing them will probably take days. further south and west. We found the big bowl with a sand dune in it - that's about 150 meters southwest of the top of the crack above the Wave. We missed the bowl with an arch and a window - I think that might be another 100 meters south and a little east of the sand dune bowl. sandstone, descending a bit on the far side into a broad valley of flat striated sandstone, which we followed around to the west. Interesting terrain, nearly flat sandstone ledges with layers dipping at a shallow angle and white or orange teepees scattered about. Eventually we came to the rim of a big wall overlooking the valley which drains out below the Wave. I'd hoped to descend via a nose of smooth red sandstone at the south end of the wall but a 20' section about half way down proved a little too steep. We sat in the shade of a rock near the top of that ridge and ate a bar and a couple of tangerines for the hike back. From somewhere above us I heard kakking like a peregrine, though it seemed a little too hoarse, so I scanned the cliff but found only a golden eagle perched on the very top of the peak. in two or three of the potholes but after that we managed to avoid it. We hiked up onto the ledges to the left once the canyon opened up and found the dinosaur tracks in the red layer just below the white ledges. Perhaps not definitively of dinosaur origin, they are nonetheless pretty convincing. Not much wildlife today either - a black bovine along the trail on the way in, several Side-blotched Lizards, Ravens, the Golden Eagle, the possible Peregrine, several Rock Wrens, a pair of Titmice in a bush above the crack (and slightly too furtive for photos) and a flock of Pinon Jays somewhere out there. On the way out from Wire Pass, about two miles from hwy 89, we turned right on a side road and found a flat spot to camp about a quarter mile up. Overnight we hung David's pack and clothing on bushes around camp hoping the odor imparted to them yesterday by his poop in a bag would dissipate. He had to go while we were in the Wave and there was no place for it, so we used a couple of ziplock bags in which we'd been carrying our lunch. Later, up on top, I found a somewhat weathered purple fleece pullover and we wrapped the bags in that, but to David's dismay the odor still managed to permeate his pack. This morning his clothes were OK but the pack wasn't quite. We stopped at the BLM ranger station to deposit the bag and I draped the poopy purple pullover on a log in the sun all day while we hiked Buckskin Gulch. It was fine, though still a little sandy, when we returned to the car at dusk. We stopped in Long Canyon to investigate a cute little slot along the left side of the road. Short, straight and narrow, it wasn't much but it was our first one for the trip so we were pleased. For future reference, the Long Canyon road is the first road which turns south from hwy 89 west of the Pariah River, Not the second, which dead-ends in a local residential area, though a left turn off that second road a block or so south of the highway leads back to the Long Canyon road. We passed more Mountain Bluebirds which were also too skittish for photos on the flats before we entered the canyon. The road to the trailhead wasn't hard to follow - we just stayed on the main drag - but the last mile was soft sand; again I was glad for the 8" clearance in our new Subaru. sandstone with David below to talk me down over the bottom chockstone. Below that the fun began - downward-sloping ledges covered with loose sand, with a 50 foot fall awaiting if we slipped. I dug sand out of cracks to find a few hand holds and scuffed sand off ledges and hoped my boots would stick. They did, and with a good deal of relief and a slight case of sewing-machine knees we sat down next to muddy Buckskin Creek to put on our waders. The water was opaque pinkish-brown and very cold but nothing a little neoprene couldn't handle. For the most part the stream was only ankle deep and about six feet wide though the water reached mid-thigh level in a few pools and concealed knee-deep quicksand in a few others. The Crocs worked better than I expected. They rarely came off, except in quicksand, and floated right to the surface when they did come off, again except in the quicksand. The canyon was breathtaking; we made slow progress downstream stopping all the time for photos. We each took several hundred. I carried my tripod and used it for virtually every shot. The quick-release worked great and after a while, I got to the point where I could set up the tripod, attach the camera, frame and take the shot, release the camera and stuff it back into my chest pack and fold up the tripod legs all in less than 30 seconds or so. The main problem I had was figuring out which way was up; there didn't seem to be any consistent indicator of horizontal or vertical unless David was standing in the picture, so on many shots I bracketed for camera angle as well as lighting. He also provided a sense of scale, to show the impressive height of the walls above us. to stop and eat. The temperature in the deeper shady sections of the canyon wasn't much above 40F and we were a little too chilled to stop in the shade. We continued hiking down the canyon for nearly an hour, passing our lunch spot from two years ago which had been sunny then but was now in the shade, before we found a sunny rock to sit on. I put down my pack then went to set up the camera with self-timer for a photo of the two of us, and by the time I had everything set up and the picture taken, my seat was already in the shade. We were just finishing our cookies, the delicious oatmeal-raisin cookies Susan made for our trip, when we lost the sunshine entirely. David and I also continued down the canyon after lunch. The canyon became generally deeper and darker the farther down we hiked. I set a turnaround time of 4PM, then extended it a half hour before we actually turned around. I couldn't recognize my turnaround from last time but I'm pretty sure we were farther down the canyon than last time. I also wasn't able to recognize the spot where I took my favorite shot from our last trip. I don't think the canyon was much different but we were there a little later in the day, which made a big difference in how particular places in the canyon were illuminated. Once we turned around we hiked steadily back up the canyon with only brief photo stops. The light was different on the way back, more pink and red, and almost no direct sunlight. I realized that I'd forgotten flashlights and I wanted to be sure to get out of the canyon before dark. It took us almost two hours to get back to the Middle Route crossing where we'd entered the canyon, about 4 1/2 miles I think. We swapped hiking boots for waders and scrambled up onto the rim just in time to see the sun before it set. We reached the car around dusk and drove to Page in the dark. Thanks to the time change we sat down for dinner in a Mexican restaurant in Page at about 7PM, the same time by the clock that we'd left the trailhead back in Utah. For today, our last full day before we had to head home, we had three locations left that I wanted to visit - Lower Antelope Canyon, Upper Antelope Canyon, and Water Holes canyon. We decided to see if we could get a permit for Water Holes first, then check out Lower Antelope and maybe Upper Antelope, then try Water Holes if we had time. We drove out to LeChee pronounced "hle-chi'ee" according to the Navajo woman at the LeChee senior center) but the Navajo parks office in the white trailer behind the pink stucco building was closed. The woman at the senior center gave us a couple of phone numbers to try but no-one answered, so we drove back to Lower Antelope Canyon. 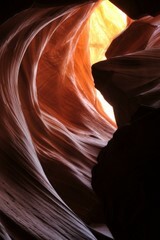 Lower and Upper Antelope Canyons are both commercial sites on the Navajo Reservation just east of Page along Hwy 98. From "downtown" Page take Lake Powell Blvd around to Coppermine Road then turn left on hwy 98 at the bottom of the hill. Or drive a mile or two south of Page on hwy 89 and turn left onto 98. Shortly after crossing the bridge over Antelope Wash and before the power plant turn right into the parking area for Upper Antelope or left, and left again, for the parking area for Lower Antelope. Both canyons are accessible only via guided tours which cost $25 per person (plus a $6/person hiking permit fee) and start at the respective parking areas. Upper Antelope requires a jeep ride up the wash so the tours are somewhat more structured, though once in the canyon it is not difficult to "lose" your tour group. For Lower Antelope you just walk in from the parking lot. Because I was carrying a tripod, David and I received a "photographer's permit" for Lower Antelope which enabled us to stay in the canyon for up to 4 hours. We used 3 of them. was coming out of middle stack this morning. He told us he'd worked all night and had welded 120 pipes, and in fact had been working for almost 36 hours straight, two 12-hour shifts of his own plus another 12-hour shift in between when he'd filled in for a friend. He explained that by the time the renovation is complete in a couple of years he hoped to have made enough money to retire. That surprised us because we'd guessed his age at about 25. We wondered what he would do after he retired but didn't ask. He was heading home to go to bed until his next shift began this evening. We tipped him $10 towards his retirement, having asked another guide if tips were appropriate. The photography was trickier than I remembered. On our previous visit I'd been using a Panasonic point-and-shoot without doing anything special with the settings. While the colors in my photos from that trip were stunning, I'd been a little frustrated with high noise levels and the inability to control depth of field. but not nearly as beautiful as the rainbow of hues ranging from purple to yellow in the photos from the point-and-shoot. After a while I found another photographer to compare settings with; he was using a D3 I think, and his photos had a beautiful range of deep reds and yellows which I couldn't seem to capture regardless of which WB setting I used. In the end I settled for switching between "Sunlight" and "Auto" with a smattering of more exotic settings thrown in for variety. The photographer I compared notes with was also using long exposures, achieved by stopping the lens way down and using a very low ISO, so towards the end I tried that approach with unfortunate results. It turns out that the 18-105 DX lens has problems with flare at high f-stops. When I shot at f18 and above with a strong highlight in or near the frame, the images were ruined by small pale circles which increased in frequency and decreased in size as the f-stop increased. A shot which would have no discernible flare at f11 or f13 would be littered with pale spots at f22. Unfortunately I didn't figure out the cause of the spots until later, and as a result ruined probably a third of my photos, particularly in the upper canyon where I used high f-stops almost exclusively. And using long exposures didn't even seem to make much difference with color saturation either, though I need to experiment a little more with that. The tripod and ballhead, on the other hand, were again terrific. I could achieve any angle I wanted quickly and easily. The ballhead held the camera perfectly stable and the quick-release meant that I could pack up and move, or re-orient the camera from horizontal to vertical, in a flash. Having found my photos from last time somewhat cluttered, I looked for simpler compositions this time. Inspecting them on the camera viewfinder I was somewhat disappointed but once I got them onto the computer, I was much happier with the results. In a state of aesthetic fatigue after three hours in Lower Antelope Canyon, we drove across the street and signed up for a tour of Upper Antelope Canyon. With two couples from Texas and a young man from Norway we piled into the canopied bed of something like a pickup truck and rode up the wash with our tour guide from Antelope Canyon Navajo Tours. I recalled his name as Mike but the card he gave me says Dalvin Etsitty 928-698-3384. Except while he was actually driving us up and and down the sandy wash, Mike/Dalvin kept us entertained with a nonstop narrative of facts and stories about the canyon, the area and tribal history, politics and lore. Engaged in looking for photos, I didn't pay much attention to his patter and at times even found it annoying; I wanted to be experiencing the canyon itself rather than standing outside the entrance listening to our guide tell tall tales. Our time in the canyon was too brief as it was. At one point Mike/Dalvin offered to help me with the settings on the camera; after a couple of minutes of frenetic button pushing, he handed the camera back to me. Manual mode, sunlight white balance, extra low ISO and high f-stop was essentially what he set up. I didn't do very well with it. Due to the high f-stops lots of shots were littered with flare spots, and due to the very long exposures, many of the others were blurred. I think maybe I didn't tighten down the ballhead enough. For future reference, next time I would use ISO 200, Manual mode, Sunlight white balance, f11 and 2-second self timer, and of course, tight down the ballhead so the lens didn't move during the resulting 1/4 - 2 second exposures. 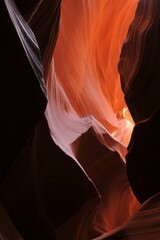 The canyon itself is more open and spacious inside and much darker than Lower Antelope. 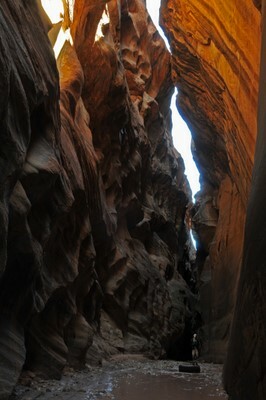 Fluted walls of dark reddish sandstone rise directly from a flat sandy floor then close in overhead allowing, during midday from spring to fall, a few beams of sunlight to reach down inside. Reflected light echoes in hot orange, red and yellow hues on the walls high overhead. It was truly an awe-inspiring place, less massive than Buckskin Gulch but incredibly beautiful. It was crowded though. Clumps of people, many lugging tripods and photo gear, huddled around guides who were pointing out each highlight and viewpoint. One of the guides was playing a flute of some kind, instrusive but at least more fitting than the rock guitar one of the guides in the lower canyon had been playing for a while during our visit this morning. Our guide had whimsical, even silly, names for the different formations he pointed out - an approach which seemed to fall short of the reverence with which the Native Peoples supposedly approach this amazing natural wonder. We lagged behind our group and no-one seemed to mind but we figured we'd better catch up with them at the end, so as not to be left behind. Next time though, I would do my best to lose the group and arrange to be left behind, as did our Norwegian fellow passenger on the ride in. He was an interesting character, coming to Arizona for a month or so every couple of years to explore slot canyons solo. He'd lost all his gear the previous week in the big slot in Zion NP. He'd tossed it across the narrow canyon and slightly upstream intending to swim across (wearing a drysuit) after it but found himself unable to overcome the current to get up to his gear. So he left it there and hiked out to get new gear, explaining "that's what Walmarts are for". When I told our guide about our desire to hike Water Holes canyon and our lack of a permit he told us "Just go hike up it and if you see a ranger, pay him the permit fee." That sounded good to us so we drove down there, following 89 west past Page to 98, then south a few miles to park on the left side just north of the bridge. The parking area was fenced and gated with a big weathered sign which stated "Entry without permission is a violation of tribal and federal law" or some such thing. Moreover the gate was padlocked, but the lock was open and several cars were already parked inside, so we opened the gate and pulled in too. I checked the windshields of the other cars, at least one of which was from out of state, and saw no permits so I figured we wouldn't attract any attention. Not until we were hiking back down the canyon around sunset did it occur to me that we would be the last ones out, and we might find the gate locked with our car inside, or worse, with our car towed away. I prayed about that but didn't share my worry with David. He'd find out soon enough. point though the first part was only 30' or so deep. Had the sun been high in the sky I think the colors would have been very nice but at 4:30 in the afternoon only the top of the rim was still sunlit. Not only were the colors subdued but one corner in the slot was so dark we had to feel our way around it. The first slot opened up into a wash again but after about a quarter mile we came to a dry pothole falls about 10 feet high. David managed to scramble around above it but I didn't quite dare follow him. By hiking up around to the left there was a place to drop into the canyon above the falls but it too was steeper than I wanted to tackle late in the day. David scrambled out that way after exploring a short ways up one of the branches. The right branch is apparently the one to take; it extends for some distance and is very narrow in places, according to The American Southwest website. for photographs when the sun emerged to light up the cliffs not long before sunset. Below the powerline we started down the middle section of the slot but when we reached the impassable dry fall we scrambled out on the left and followed ledges along the rim back to the car. As I expected we were the only car left in the parking area, but much to my relief, the gate was still unlocked. About a mile down the road, I noticed a fluttering on the windshield, a note under the wiper. It was from the ranger asking that we lock the gate on our way out so we returned and did so. With gratitude to Jesus and the Navajo ranger. comfortable spot to camp along one of them. Rather than cook we ate the last of the food Swee sent with us, baked beets and hommous and cookies, brushed our teeth outside in the cold and dark for the last time and slept well on beds of sand that I leveled with our snow shovel. In the morning we packed up soon after sunrise and drove down to the dunes for breakfast, granola in our warm car in the sunshine. Outside a stiff northeasterly breeze was blowing but we went out for a short hike on the dunes anyhow. It was cold so we didn't stay out long. Nice light and interesting patterns in the blowing sand. We left the dunes around 9AM MDT and drove north to 89, then north on 89 to 14 which we followed over the mountains still buried in snow. About 10 miles before Cedar City We passed a flock of wild turkeys but by the time we turned around and got the camera ready, they'd vanished into the bushes. We had better luck with a Ferruginous Hawk a half hour south of Baker and a male Northern Harrier outside of Ely, where we stopped for a late lunch. Sunset caught up to us not far south of Twin Falls. We considered stopping at the Oregon Trail agates site again but would have had to leave there by sunrise so we just kept driving instead. On the way down David had been tired and I'd done most of the driving but from Twin Falls home, David did much of the driving while I slept. I think we got home around 9AM but I don't remember much from the last 12 hours of our trip.